The year got off to a slow start. The Telegraph teed off after three rounds, reporting in march that it was the lowest crowd attendance for the first three rounds in 12 years. More accurate reporting. The NRL having introduced uniform and electronic counting methods for measuring attendances by all 16 clubs. As recently as three years ago, the crowd figures at some grounds were considered little more than an educated guess, while some clubs included all tickets allocated – including members who didn’t turn up – rather than number of fans who actually attended the match. Broadcast times – such as Channel Nine’s decision to broadcast the Sunday match of the day live at 4pm and the shifting of the second 7.30pm Saturday game to a 3pm kick-off for Fox Sports. Both time slots are less attractive for fans wanting to attend matches but better for television viewers, who now get live coverage of an additional two matches per weekend. 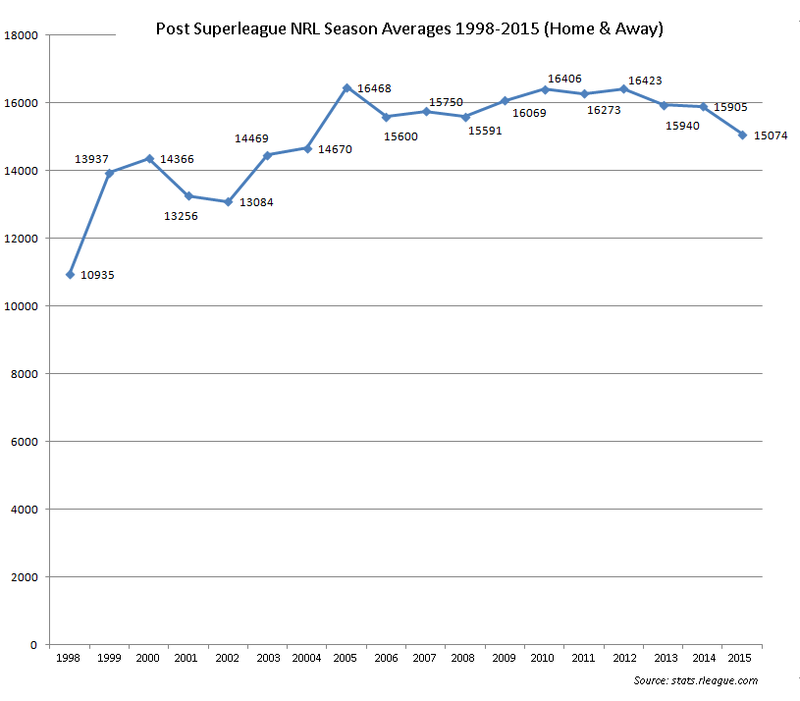 By Mid year News Limited were reporting that NRL crowds had slumped to their lowest point in a decade. 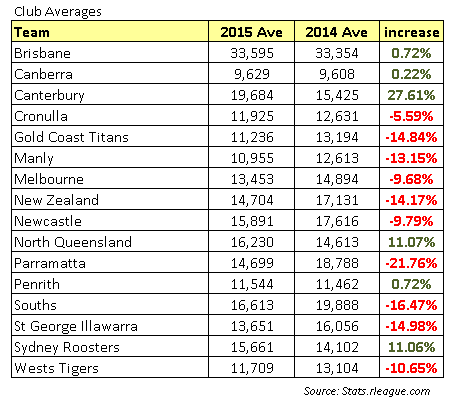 It wasnt all doom and gloom, the NRL hosting a record Origin attendance at the MCG. A massive crowd of 91,513 packed the home of sport for the showdown, cementing Melbourne’s place as the sporting capital of Australia. In September, Brisbane and North Queensland played a semi final at Suncorp which attracted more than 50,000 fans – a figure the Telegraph claimed was three times that of the three sydney finals played over the weekend. While two Queensland sides in the finals and an all Queensland grand final, hosted in Sydney, had many thinking attendances might fall away, but a record of 353,086 beat the previous finals mark of 351,448 set in 2009. Sunday night’s game made up a large chunk of that figure with 82,758 interstate and local fans turning up to ANZ Stadium.